National Grid has published the Triads for winter 2017/18 – and the good news is that Inenco’s Triad warnings alerted businesses to reduce their consumption on all three of the Triad dates. If you were signed up to Inenco’s Triad alerts, did you manage to avoid the key times? 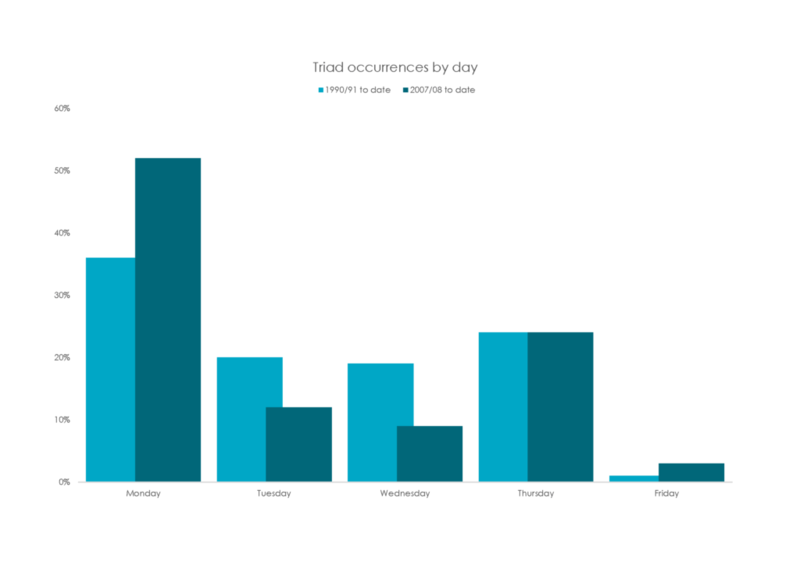 In some ways, this year’s Triads have been typical – all three occurred on a Monday, for example, which is statistically the most common day for a Triad to fall on with over half of all Triads occurring on a Monday in the last 10 years. 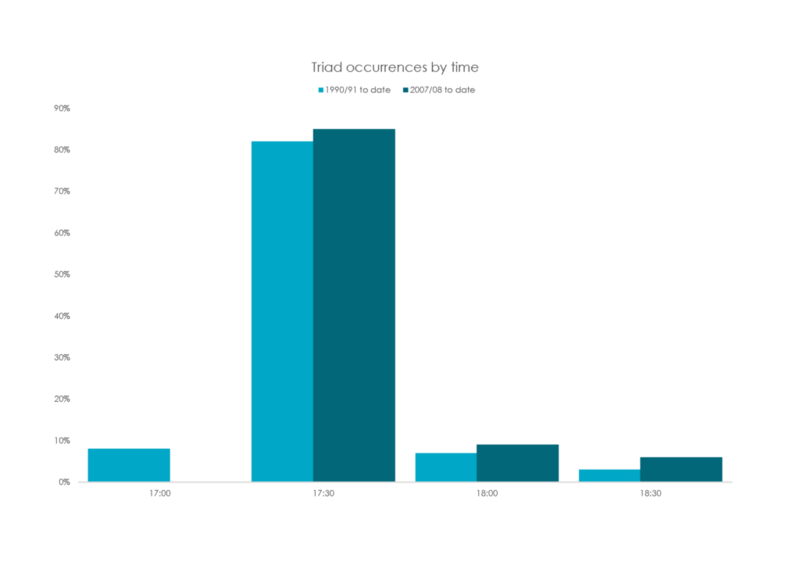 We often expect Triads to fall between 17:00-17:30, with some 85% of Triads in the previous 10 years occurring in this period, as that’s the time that people begin to get home from work and push up the demand for electricity. Although the first Triad fell into this period, the second two Triads did fall slightly later in the day than we’d expect, with the second falling at 17:30-18:00 and the third at 18:00-18:30 – which is only the second time we’ve had a Triad at that time in the last ten years. That’s likely because they occurred in February, when days are getting longer, people were turning on lights etc. later than they would in December/January. In fact, at just two days before the end of the Triad period, the final Triad was the latest in the year on record by some 11 days. With the majority of Triads occurring during December and January, it’s quite surprising to have two Triads in February. Apart from some significant snowfall and low temperatures around the time of the first Triad, the winter had been fairly mild until the ‘Beast from the East’ hit the UK and pushed temperatures down significantly. Snow hit the UK again at the beginning of February, triggering the second Triad, and while the Beast from the East didn’t reach the UK until later on in the week beginning 26th February, low winds and very low temperatures combined to cause the third Triad. Despite the cold snap, the highest peak demand of 48.6GW on Monday 11th December continued the trend of falling peak demand, as it was 3.2% lower than the highest peak demand in 2016/17. In fact, we have to go back to 1995/1996 to see a lower peak Triad! What do the Triads mean for businesses? If you were signed up for Inenco’s Triad warnings, you will have received an alert in advance of each of the confirmed Triads to warn you that we expected them to happen. If you responded to these alerts by reducing any non-critical consumption during the Triad periods, you should have been able to successfully mitigate some of the costs associated with them. However, if you weren’t signed up to our alerts, or you didn’t act on the alerts we sent out on these days, you’re likely to face significant transmission network (TNUoS) charges for your consumption during the Triads. As the Capacity Market levy also came into effect for winter 2017/18, adding levies of around £40/MWh for half-hourly consumption during 4-7pm on weekdays between November and February, you may find that your energy costs have been substantially higher over the winter period. With the CM levy set to rise to £100/MWh next winter (2018/19), we’d advise all businesses to act now to get a strategy in place in time to avoid excessive charges during the colder months. Inenco’s proven aptitude for predicting Triads means that our Triad alert service is very beneficial to many businesses – but only if they act on the alerts! It’s vital to have a plan in place for reducing consumption during predicted Triad periods so you can respond quickly when necessary. It can be easy to become more complacent about energy costs in the spring and summer months, but preparing early can make a real difference to your energy costs. If you’re interested in signing up for Inenco’s free Triad warnings, or need advice on how to create an energy strategy that keeps your costs low throughout the year, talk to our experts today on 08451 46 36 26 or email enquiries@inenco.com. The importance of Triad season: What does it mean for energy managers? What will inaction cost your business? The shift to non-half hourly billing and settlement under P272 means that more businesses can choose to pass through TNUoS costs and minimise charges.